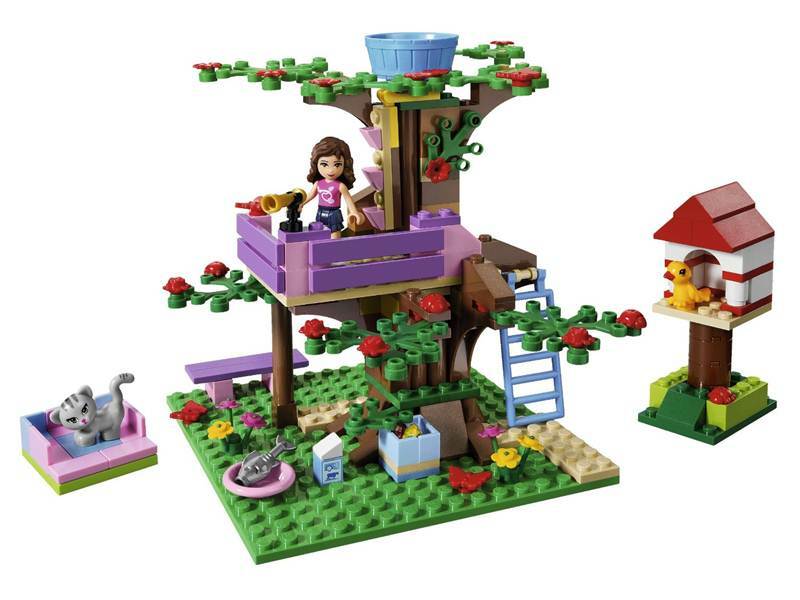 As the New Year launched so did a brand new line of LEGO toys, LEGO Friends, an entire line of LEGO building blocks and play sets aimed at girls 5 and up. 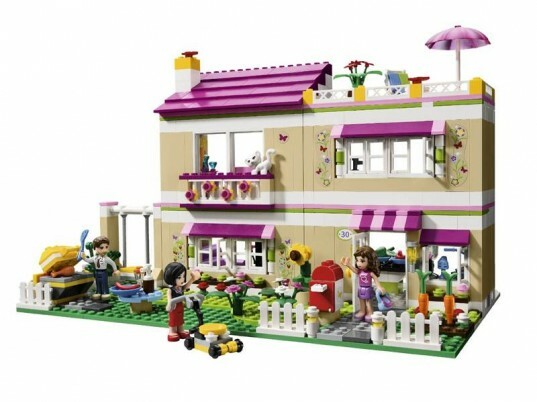 Bricks in shades of pink, lavender and other pastel colors dominate this new LEGO Friend world. The LEGO Friends minifigs have been updated to appeal more to girls as well. The new girl minifigs are longer, more realistic in shape, and while 29 in all will be released in 2012, there’s a core group of five main characters each with their own biographies, personalities and names. The new collection is set in the fictional city of Heartlake, which comes complete with a salon, a horse academy, a veterinary clinic, a café and more. LEGO Friends is LEGO’s sixth attempt over many years to lure as girls into the mostly boy-saturated LEGO world, but some don’t like that the company has seemingly gone out of their way to create an entire LEGO world just for girls. From what I can gather, there are a couple of major arguments against this new pretty, pink collection. First, some say that there are already LEGOs for girls – i.e. any LEGOs already on the market. Some parents seem baffled as to why LEGO finds it necessary to single out a special just-for-girls line, when there’s so many sets on the market already. The other argument is that some people feel that it’s just plain sexist to target girls with pink toys or toys that shows girls baking, doing their hair or decorating a house. For example, one reader comment at BabyCenter states, “It annoys me when people feel the need to make “pink” or “girly” versions of everything. We can play with the real things too! ugh.” However, comments like this make me wonder why “pink” or “girly” toys are not considered “real things” or a viable option for girls (or boys). Although parents all over the web keep saying, “Legos were perfectly fine for girls just as they were,” research says differently. As one article points out, LEGOs are the hottest toy for boys, but girls simply aren’t as impressed. While it’s true that plenty of girls do adore LEGOs, the market is quenched with stereotypical boy sets and boys buy more sets than girls. 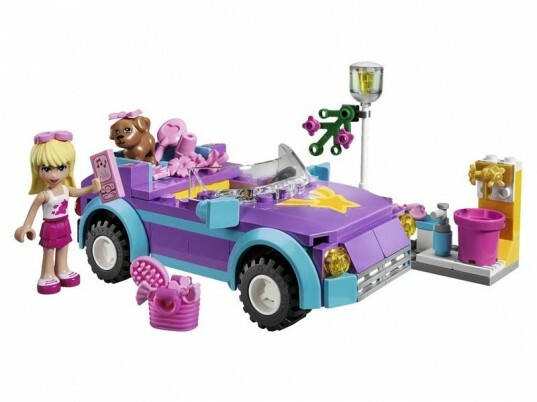 The other argument for the new LEGO Friends is that LEGOs do offer untold benefits. Research shows that young children who play with blocks score, on average, 15% higher on language tests. According to the same research, tasks such as building a LEGO structure allows kids to begin to grasp the world around them, plus kids who engage in imaginative play may have better impulse control and longer attention spans. According to other research, blocks help kids learn skills like math, spatial relationships, fine motor skills, creativity and problem solving. All-in-all, if block makers want all kids to benefit from blocks and building, it’s a smart move to create sets that may appeal to more kinds of kids. 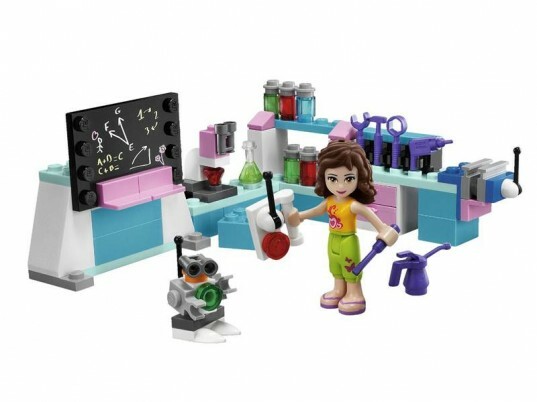 LEGO did some extensive research into how girls play, while designing the new LEGO Friends line. LEGO found that girls favor toys that encourage role-play, storytelling and rearranging pieces as well as beauty, friendlier colors and a high level of detail. They nailed me as a kid. I LOVED pink and lavender. Barbie, My Little Pony, nail polish, frilly dresses and sparkles were all I wanted. I did exactly what the LEGO research said too; I’d act out stories, rearrange my Barbie house, and I wanted toys with super tiny details. I had some LEGOs as a kid but rarely used them. I didn’t love LEGO colors and I was sick of all the tiny figures in hard hats (all boys). LEGOs were not made for the kind of little girl I was. Had LEGO Friends been around when I was little, I’m sure I would have wanted to play with LEGOs more often. The pink deal wasn’t due to my upbringing either. My own mom was pretty much the poster child for women’s rights. She’d distinctly point out that I didn’t have to have pink. In fact, she’d have liked it if I’d been drawn to neutral toys. Problem was, I wasn’t. My sister, raised by the same mom, liked so-called “boy” toys and would try to sneak transformers into my Barbie dream home, much to my dismay. My brother had cars and Barbies, playing somewhere in-between my sis and me. Of the three of us, only my sister played long-term with LEGOs. Who can explain why kids like what they like? I do know that all three of us grew up to believe women and men deserve equal rights. I do know that liking pink didn’t turn me into a pushover. I’m not waiting for a prince charming and I don’t act shy and giggly simply because I liked pink princesses as a kid. Why Can’t Kids Have Options? I have one, very boyish son. Knowing me, you’d think he’d like “girl” stuff. I bought the kid dolls and gender neutral toys, yet all he’s ever wanted are toy cars, play swords and yes, boxes and boxes of LEGOs. My best friend, a raging tomboy her whole life has one daughter. My friend is raising her with all kinds of toys, but Bella is determined to get her little hands on anything pink and glittery she can grab, something my friend is confused by, but she allows it, because that’s what her daughter wants. LEGO offering more choices is just that, more choices. I doubt LEGO’s goal is to keep girls out of the White House or teach them that they can’t be astronauts. They are simply offering choices that some kids might find more appealing than the vast sea of aliens, cars, ninjas and monsters that currently rule Lego world. Those choices are hardly gender-neutral by the way. Yet no one is freaking out and saying, “Hey, quit making boys think they have to fight green monsters all the time!” Perhaps pink and purple LEGOs may even inspire more girls to become architects, engineers and industrial designers, which are all still male dominated industries. If all boys and girls played the same, and liked the same stuff, there wouldn’t be an issue. LEGO could toss out a big box of all white bricks and kids would be a-ok. However, all kids do not play the same, sometimes in spite of how their parents may be raising them. I don’t think LEGO Friends are sexist. These blocks aren’t saying one gender is better, they’re simply acknowledging that different kids like different toys. I agree completely with the last sentence in this article. Why can't girls do things that girls traditionally do and do things that boys traditionally do? I loved playing with my brother's Logos but I wanted more girlie ones. They had very few in the 80's. They only one I can remember is the Horse Ranch. Just let them play with all the legos and stop saying these are for boys and these are for girls. The company can advertise however they want, but it's how you handle it in your own home that you're kids are going to notice most. Being a female, born in 1970, and a lover of LEGO's since my parents bought me my first set in 1977, I can honestly say, "It's about time!" Back in the 70's bricks were still primarily red and blue. No castles yet, or pirates, or aliens, or RC cars (notice the gender bias here?) I had a TON of basic blocks, a house kit, and a set that made a manually powered big rig and auto shop. I LOVED my LEGO's; but they were basic, and the only thing available. And, although probably less intentionally, more geared towards boys. Fast forward 30 years, and even though they have come out with AWESOME themed sets, the LEGO people have hardly changed. Despite the fact that the mermaids have lips and lashes, they're still in a boy's world of play. We have lots of LEGO's. Most from the City collection. My son (6) and my daughter (8) love them; but my daughter has constantly asked why they don't make sets more for girls. We pulled all our girl figurines out; but they all still looked like boys or boyish. The most girly one looks like a boy with lips, or an 80's hairband rocker, especially since the "clothing" is SO male or gender neutral. My daughter just about stole the sign at the store this week when she saw LEGO was coming out with the Friends collection. When we got home, she ran to the computer to learn more. She is ready for them, and we will buy them. Yes, they are pastel, and girly, and they have a beauty parlor. But they also have an animal hospital and a tree house and an invention workshop. This is the plan, we're adding a few Friends sets to the more boy-based collection we have, and I'm quite willing to bet that some AMAZING new creations come out of it. FYI: despite "gender biases", boys like pink and purple, too. I have started a Petition against the SPARK Movement and trying to control Lego's decision to Develop products they want and market them to whom and how they want. http://www.change.org/petitions/spark-movement-let-lego-company-make-up-their-own-minds-about-products-and-marketing# Fight back! Let LEGO spend their money and run their business how they want! @weeboomoma and @RSchatz excellent comments! I really hope LEGO doesn't cower down to this pressure from folks who think smart girls shun pink. It's getting old already. Kids should get all kinds of toys which is what LEGO is now offering. @jayk500 we've got a post about the Spark petition going up soon, maybe tomorrow. It irked me to no end. I like your's better, but for me, the issue is less about people allowing LEGO to market how they want, and more about how girls (or boys) who like feminine toys are just as good as other kids. Kids should be allowed the choice to like what they like. That Spark petition is telling us that what constitutes a smart, capable girl or woman is the ability to avoid "girl" stuff, and it's extremely lame. They're flying off the shelves. They're a hit with my cousins - after I spent HUNDREDS on Lego before trying to get them into it, they're finally in thanks to Lego Friends. To hell with the if it's pink it's evil crowd. They've got a camera, laptop, music players, hammer, microscope, etc. in the sets they have, not kitchen utensils and makeup. Shoot, out of fourteen sets there is only one with a handbag / beauty focus. Idiots. I'm thankful for these. All past sets are getting a second look, the minifigs are being reshelved, but the lego is being used!!!!!!!! Not everyone is you. 8wGremlin, This is very strange. I recall a female snowboarder and female surfer. I recall a zoo keeper and pro tennis player. A nurse too, but I guess you would call that stereotypical. And yet, my mother is an RN of thirty years and makes a great deal of money. You see that's just it, there are fitness instructors, ice skaters, cheerleaders and pop stars. It may not fit your unique girls must always be strong world view, else you wouldn't have a problem with the full range being available, but there are girls who want to be fitness instructors, ice skaters, cheerleaders and pop stars. Do I have issues with there being few female minifigs? Yes I do, I made a concentrated effort a couple years back over the course of several months, pretty much spending every spare dollar I had, to get my cousins into Lego. I bought starter sets, a lot of Lego City, minifig series, Harry Potter and many others. I even looked for minifigs on eBay. I found it difficult to keep the gender balance, but that wasn't the real issue. The real issue was that they never got excited by any of these Lego sets. They would give them a few minutes of play and then wander off. Several times over the years I would try to inspire building with Legos by suggesting, and demonstrating, building the various things they liked. No real success to speak of. These are girls who wear baskets as helmets, grab Nerf guns and walkie-talkies, and plan attacks on their teenage cousins. They're obsessed not just with Sims 2 or 3, but also with the Fable and Portal series. They've got incredible imaginations and they're well aware that they can be anything they wish. I've got high expectations of the middle child; I believe she'll be nothing less than a high powered CEO, doctor or world overlord. She's a natural leader. Time will tell. These sets are not for you; they're not for parents with children who love playing with Lego. They're not even aimed at those children who love playing with Lego. The aim here is my cousins. Girls who want to play as girls, and could be inspired to build. Face it, the minifig even with its most feminine face and best hairpiece lacks any real semblance of the female form. It's a strong form. It outlasts my male form by years. And it has worked. They ADORE these sets. I've bought eight sets since release. They've been excited by every one. Lego Friends has inspired them to look again at all those sets I got them in the past. They're using all the Lego, except the minifigs. They really don't like the minifies and that is OK. Shoot, I don't recall seeing a laptop in even the Lego City series, but Lego Friends has one. It also has music players, hammer, screw driver, microscope, oil can, etc. My cousins absolutely can pretend to be everything they wish. Buy a set or two. Give them a try before you denounce them. As for your daughters' brothers, they can play too. I think that maybe they should make more girls in the ORIGINAL lego brand. That would be better than a pink princess version. It's not like we're another species! As the New Year launched so did a brand new line of LEGO toys, LEGO Friends,�an entire line of LEGO building blocks and play sets aimed at girls 5 and up. Bricks in shades of pink, lavender and other pastel colors dominate this new LEGO Friend world. The LEGO Friends minifigs have been updated to appeal more to girls as well. The new girl minifigs are longer, more realistic in shape, and while 29 in all will be released in 2012, there's a core group of five main characters each with their own biographies, personalities and names. The new collection is set in the fictional city of Heartlake, which comes complete with a salon, a horse academy, a veterinary clinic, a caf� and more. LEGO Friends is LEGO's sixth attempt over many years to lure as girls into the mostly boy-saturated LEGO world, but some don't like that the company has seemingly gone out of their way to create an entire LEGO�world just for girls.